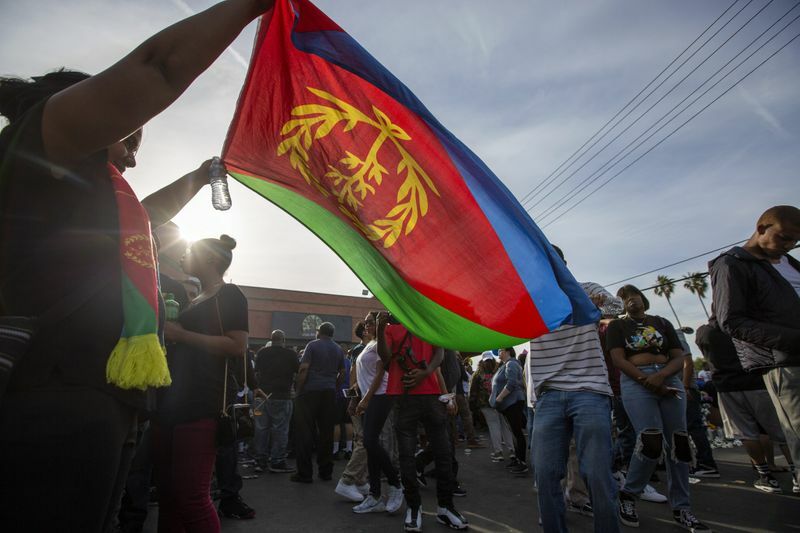 Nipsey Hussle thought Marathon Clothing could be a seed to revive the impoverished Los Angeles community where he grew up. 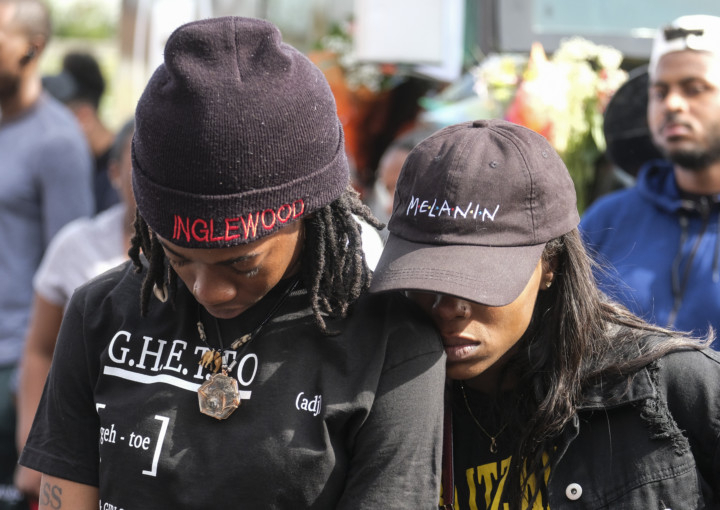 The 33-year-old rapper and his business partner purchased property in the Crenshaw neighbourhood, intending to knock it down and erect a six-storey residential building atop a commercial plaza, with Marathon as its anchor. But as Hussle stood in that same plaza on Sunday afternoon, he was shot and killed by an unknown assailant. 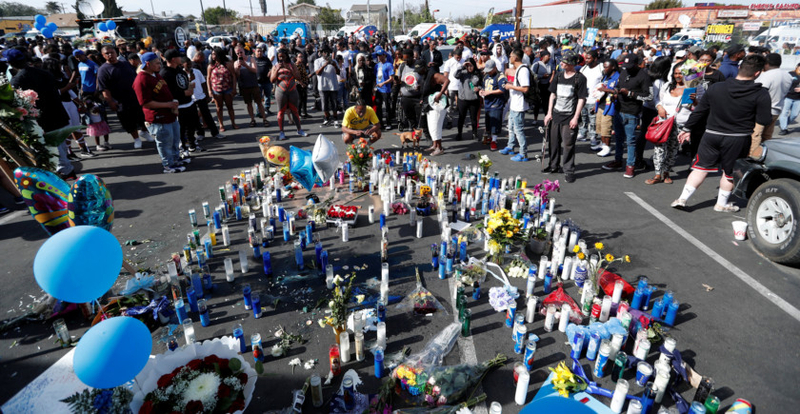 On Monday, that corner again turned violent and chaotic after a fight erupted in the crowd at a memorial and bottles were thrown, police spokesman Josh Rubenstein told KCAL-TV. He said no shots were fired and at least six people were hurt. Fire Department spokeswoman Margaret Stewart said one person was found in critical condition with a “penetrating injury.” Stewart said other patients were being examined after they apparently were trampled when the crowd — which Rubenstein estimated at 300 to 400 people — began running away. Police cleared the crowd away and were seen carrying one man to an ambulance. Denise Francis Woods, a neighbourhood resident who is running for City Council, remembered when Hussle used to sell his demo tapes on street corners in the neighbourhood for $5 (Dh18.3). 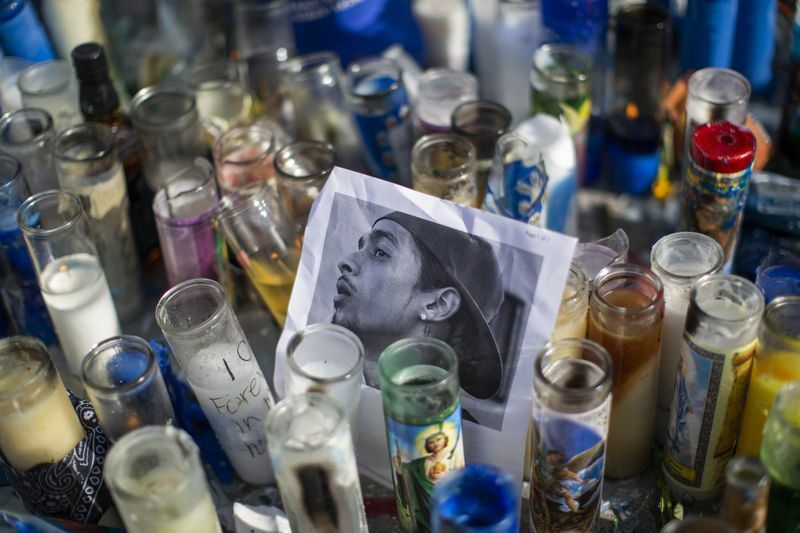 An autopsy performed on Monday found that Hussle’s death was a homicide, caused by bullet wounds to the head and torso. Police did not reveal a motive or publicly identify any suspects. Two other men standing near Hussle were shot and wounded. 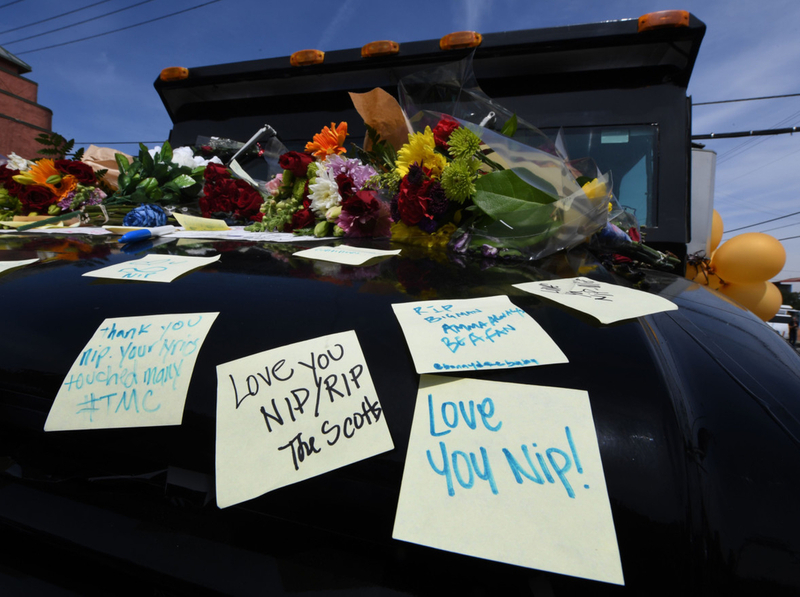 His hip hop friends and other stars, including Rihanna and Snoop Dogg, mourned on social media, with many pointing out his particular role in uplifting African Americans. Born on August 15, 1985, Hussle said his first passion was music but getting resources was tough after leaving his mother’s house at 14 to live with his grandmother. He said he got involved in street life as he tried to support himself, and he joined the gang Rollin 60’s Neighbourhood Crips as a teenager. Hussle said his stage name, a play on the 1960s and 70s rhyming standup comic Nipsey Russell, was given to him as a teen by an older friend because he was such a go-getter — always hustling. He charged $100 for his 2013 mixtape ‘Crenshaw,’ scoring a cash and publicity coup when Jay Z bought 100 copies for $10,000. Last year he hit new heights with ‘Victory Lap,’ his critically acclaimed major-label debut album on Atlantic Records that made several critics’ best-of lists. The album debuted at No 4 on Billboard’s 200 albums charts and featured collaborations with Kendrick Lamar and CeeLo Green. “So so SAD man!! DAMN man this hurt,” LA Lakers star LeBron James said in one of many emoji-laden tweets about Hussle. 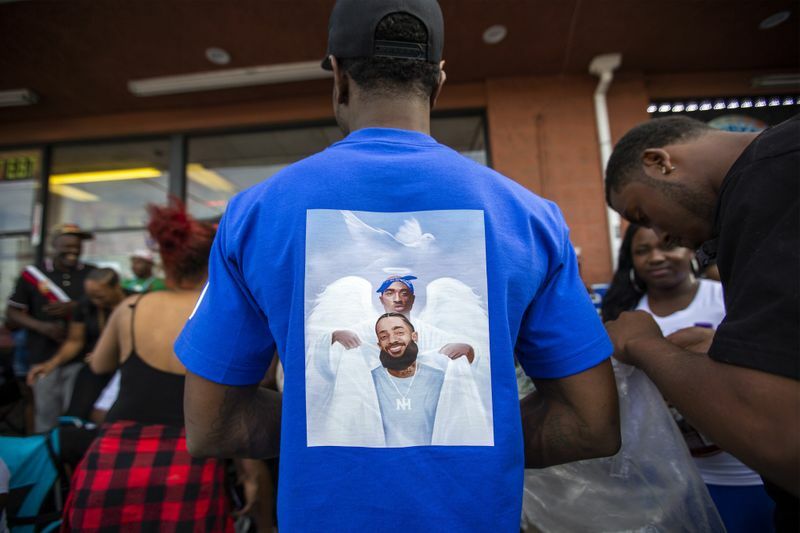 At the LA Clippers game on Sunday night, players Montrezl Harrell and Lou Williams had specially made replica jerseys with “Hussle” on the back hanging in their lockers just a couple of hours after his death, and Hussle’s picture was shown on the arena’s video screens before tipoff.